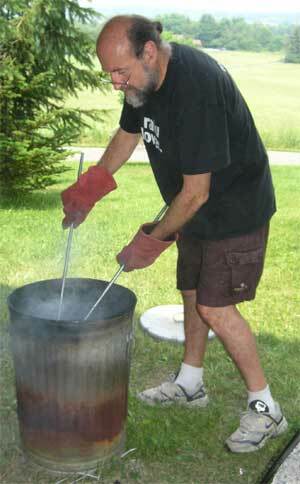 Anyone who can hold a brush can participate in Raku Live! Raku Live! 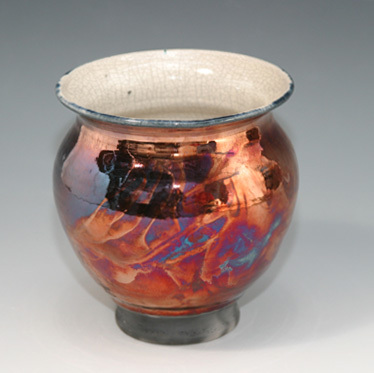 is a participatory art event that engages the customer in the creative process and uses a rapid firing technique called raku. 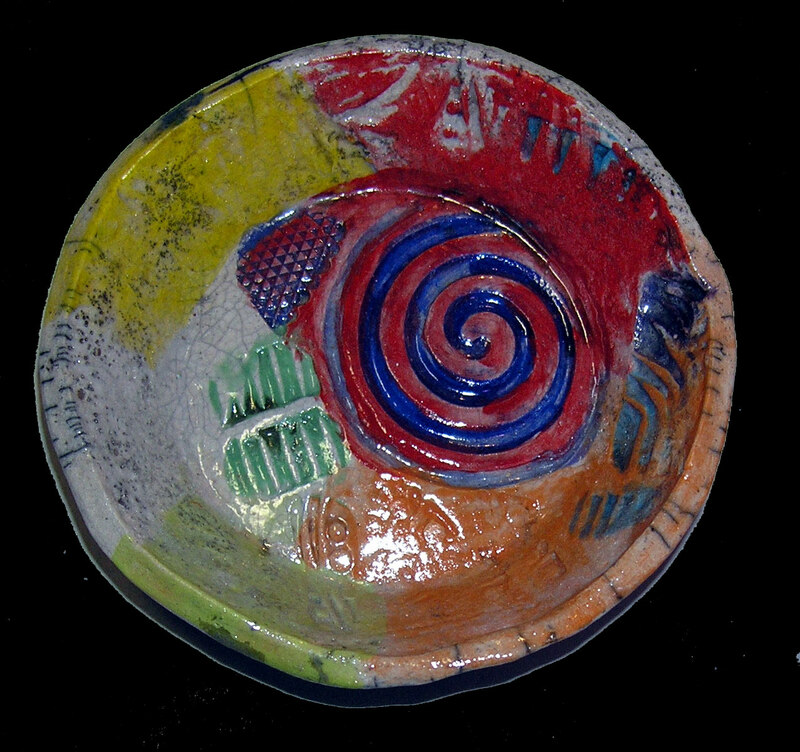 The customer selects a piece of bisqued ware; then paints glazes on the surface. 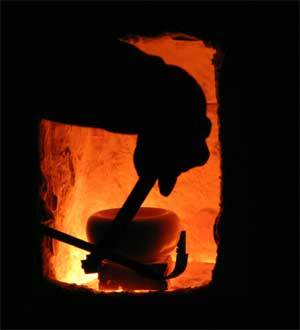 The kiln operator then fires the pottery to a temperature of 1850 degrees F. in 20-30 minutes. 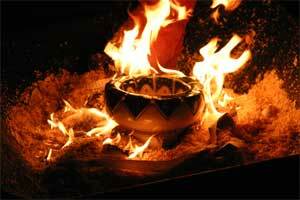 He removes the red-hot pots from the kiln with tongs and places them in a metal can filled with paper, resulting in a smoky oxygen-depleted environment. The pots cool for about ten more minutethen are removed from the can and quenched in water until cool enough to handle. 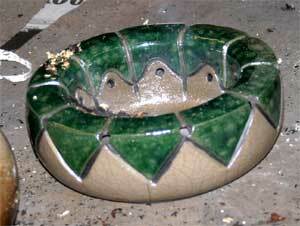 The complete process, from brushing on the glaze to holding the finished pot, takes about one hour. meticulous deliberate process--both with remarkable results. Raku Live! is portable.We take it to craft fairs and festivals.We can also provide private raku parties at the host location, if suitable. 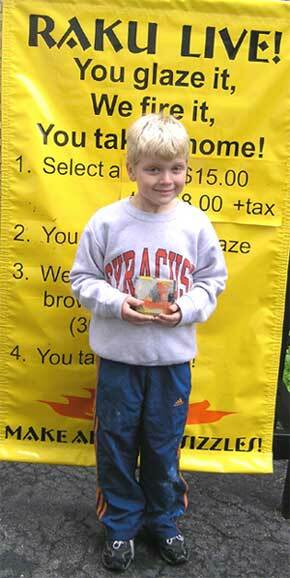 Throw a Raku Live! party in your home with specially designed raku bisque objects. Contact us to discuss arrangements and availability.
" I wanted to thank you both for your time, knowledge and patience with our girls. It was a wonderful experience and the kids really enjoyed it. They must have gone home and talked about it all as well because I have had several parents thank us for the opportunity which I said the thanks belonged to the two of you. I think you are both very talented and do an excellent job of explaining the process and guiding the kids.